Fabricated of alloy 18-8 stainless steel, type 304, 18 gauge. Dispenser lever is a ruggedized Zamak alloy casting. 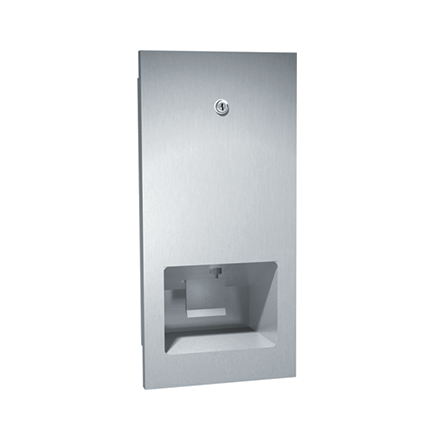 Dispenser door attached to unit at the side with a full length 3/16′′ (5mm) dia. stainless steel multi-staked piano hinge and shall be held closed with a tumbler lock. A refill viewer slot is provided at front face. Valve fabricated of heavy-duty vinyl and is permanently attached to a disposable soap cartridge. Soap is forced through disposable valve by pulling a lever forward. Disposable cartridges are available to dispense soap, hand lotion, heavy duty cleaner, waterless cleaner and antiseptic soap and are typically good for 1500 washings. Typical soap cartridges are super-concentrated cleansing formula approved for medical and food handling facilities. Viscosity Range (mPa·s or cP): varies with product and manufacturer chosen; see product MSDS and info.